Part Norman, part Jacobean and part Victorian, Hay-on-Wye Castle is to be found at the heart of the town of Hay-on-Wye (Y Gelli Gandryll in Welsh). Hay-on-Wye lies on the south-east bank of the River Wye, and is situated at the Northern-most point of the area known as the Brecon Beacons National Park, at the Northern side of the Black Mountains. It is positioned just within the Welsh side of the border with Herefordshire, England. Although Hay-on-Wye is in the district of Brecknockshire in Wales, it falls under the administration of Powys County, and is at present most commonly known as ‘The Town of Books’. Hay-on-Wye is the National Book Town of Wales and it hosts the very well known ten-day Hay Literary Festival, which attracts writers, readers, and artists from all over the world. Hay-on-Wye is beautiful and awe-inspiring. Set in the heart of mid-Wales, the remains of the Castle include a four-storey keep and a beautiful arched gateway. The Keep measures 10m from north to south, by 8.3 metres in width, being surrounded by a curtain wall with a gate. During the turmoil of the Baron’s War, a small tower was added in front of the gateway to form a proper gatehouse complete with portcullis. The lowest habitable room includes the remains of a late Norman window facing the court. Above it is a better preserved specimen, lacking only the mullion between two round arched lights set in an outer round arch. No other original features survive today. At some point, the Northern corners of the Keep were provided with heavy buttressing and in the 15th century the North wall was enriched with wooden lintelled fireplaces. The 12 metre long section of curtain wall east of the gateway is all that remains of the way around the courtyard, which was about 75 metres in length from east to west, by 65 metres wide. 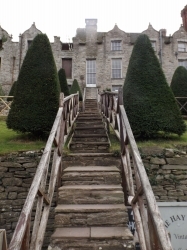 Remains of the 18th century formal gardens and the 19th century terraced gardens can still be admired. The Castle lies on the southern side of the town of Hay, near the West Gate. The Black Lion Gate was to the east and the Water Gate to the North. These gates were all removed in the late 18th century to make way for the railway. 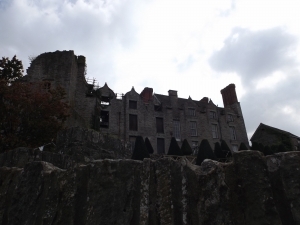 The town and Castle of Hay-on-Wye were put on the map in April 1977, when the book connoisseur Richard George William Pitt Booth, declared Hay-on-Wye an independent Kingdom, and nominated himself King. Since then, Hay has been known as ‘the town of books’ and been home to the Hay Literature Festival, which started to take place as of 1988, and which brings more than 80,000 publishers, writers and readers from all over the world to visit. During the rest of the year, Hay is a Mecca for books, having more than thirty major bookshops. Richard Booth’s shop is the second largest one in Europe. In 2011, the Castle was purchased by the Hay Castle Trust Foundation – a registered charity set up to preserve the historical building. The aim is to restore the Castle and transform it into a centre of culture, education and the arts. Currently the Castle and manor are in serious need of conservation in order to prevent further deterioration. The Norman Keep itself is unstable and unsafe for entry by the public. 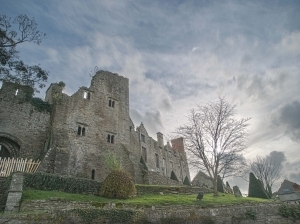 The east wing of the Jacobean manor is roofless and its decorated stone walls are collapsing. The Trust invites all kind of help and donations in order to support its project, also welcoming annual membership subscriptions and volunteers. The Honest Bookshop, a second-hand bookshop found just inside the Castle’s walls, is a charming space where one can leave old books and take unread ones while leaving a donation. All proceeds help maintain this iconic attraction. One can donate books by simply dropping them off or adding them to the shelves. Castle Tours currently take place every Thursday at 11am and are run by Hay Tours. Each tour is approximately an hour long. Unfortunately, these tours are as yet unavailable for wheelchair users as long as the Castle is undergoing renovations, because of the uneven surfaces and stairs.